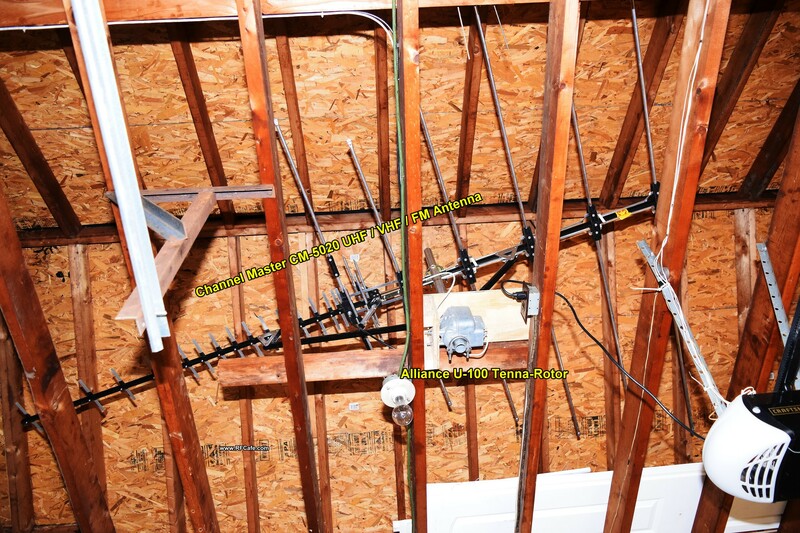 If you grew up in the era of rooftop television antennas, then there is a good chance you are familiar with the electromechanical antenna pointing systems that were often installed as well. 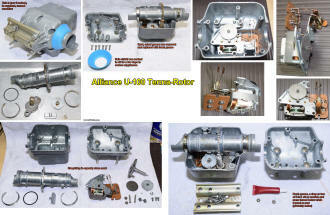 Alliance, Channel Master, Cornell Dubilier, Radio Shack, RCA, Winegard, and others made low cost, light-duty rotators for television antennas. 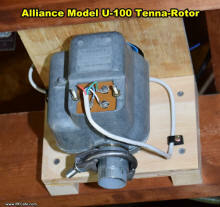 Ham radio antenna rotators were/are more robust in order to handle higher weight and wind loads. Many television antennas also cover the FM radio band (88-108 MHz), allowing them to do double duty. 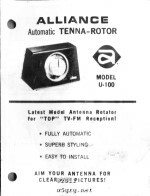 There are a few companies (Audiovox, Channel Master, RCA) who still sell antenna rotators that are modern transistorized units with digital readouts. 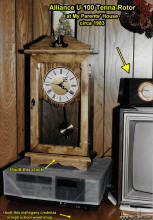 Some allow you to store channel number / antenna direction combinations rather than having to remember the antenna direction for a particular channel. Customer reviews of the new units reveal dissatisfaction with the weakness of the rotator unit that mounts on the antenna mast, and the inability of it to prevent the antenna from being rotated in a strong wind (no brake or poor brake). 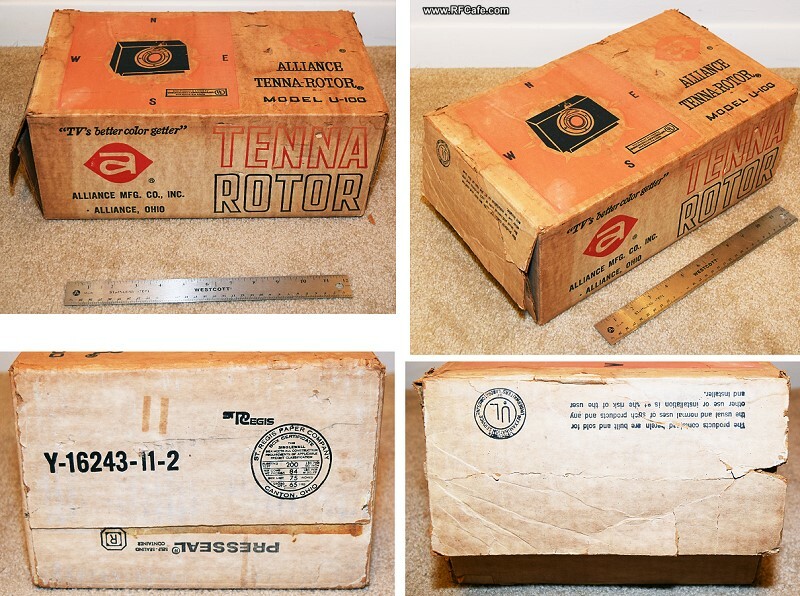 Being an unapologetic technology renaissance man, I recently purchased (on eBay) a vintage Alliance Model U−100 Tenna−Rotor that was unused in the original box. The seller found it in his father's attic. It was advertised as NIB (New-In-Box), which typically means it includes all the original parts, but it arrived missing a couple U−bolts (no big deal) and the cover for the control cable junction box (a bigger deal). I waited for many months for such an example to appear at a decent price because of wanting to document the entire system as originally supplied, so it was disappointing to have the cover missing. I plan to make the best of the situation and exploit my local library's MakerSpace facility's 3D printer to make a replacement. A photo of the cover will be added here when it is available. 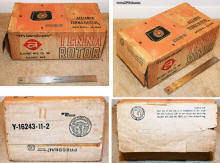 Upon receiving the U−100 Tenna−Rotor, the first order of business was to open the enclosures and do a visual inspection. Everything looked good except the grease in the rotator was hard caked and needed to be cleaned off and replaced, which I did. As you can see in the photos, the cast aluminum parts are very robust. 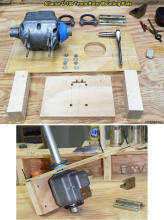 The "brake" built into the Tenna−Rotor is accomplished via the worm drive. A worm drive is like a mechanical diode in that only a rotation of the worm input motor drive shaft will cause the output shaft to rotate. Applying a torque to the output shaft, which is connected to the antenna, cannot cause the worm gear to rotate. It is possible for the wind or some other force to prevent the antenna shaft from turning as the worm gear tries to turn, which would strain or stall the motor, but it cannot be forced forward or backward. Load bearing surfaces are simple bushings rather than ball bearings, but the shaft will turn so little in a typical lifetime of use that it shouldn't matter. Mechanical drawings were located on the Norm's Rotor Service website and Bougetoline has schematics, so I thank them for that. Lower quality copies are posted here in case they ever disappear from Norm's Rotor Service website. Unlike the newer systems that use a 3-wire control interface, the Alliance U−100 Tenna−Rotor uses a 4-wire cable. 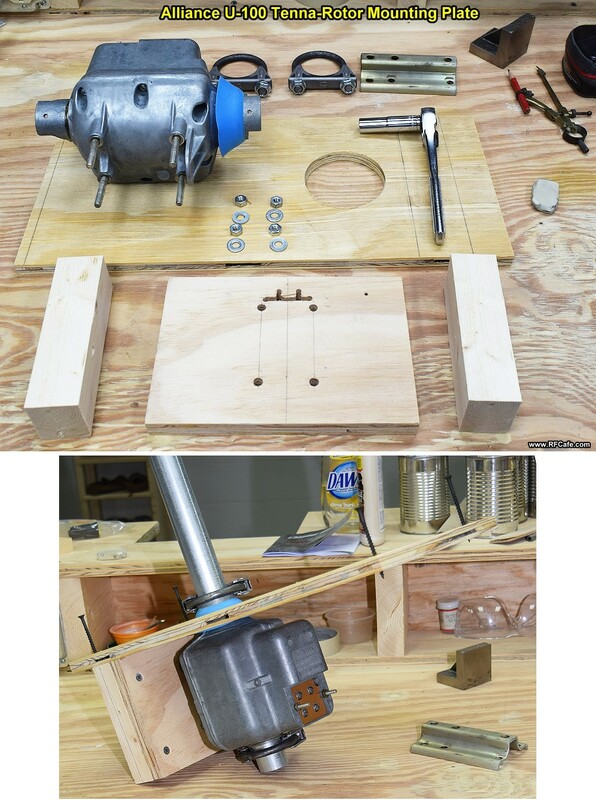 Control and feedback is about as simple as it gets with a motor turning the antenna mast and a solenoid in the control box that advances the dial as the antenna rotates. Cams on both ends open and close contacts as required. The rotator box motor rotation direction is determined by which set of field coils is energized by the control box; i.e., no fancy reversal gears to fail. Do you remember the signature ker-chunk, ker-chunk sound of that solenoid turning the controller dial? That was one of the reasons I wanted this old system, just to hear that sound again. 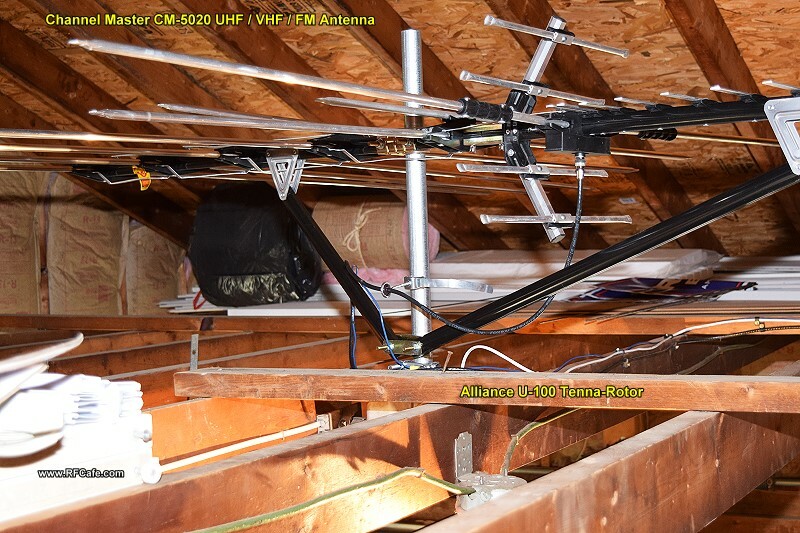 When I first began planning an antenna installation, I was going to put it on the roof like in the old days, but I decided I would try it in the garage attic first to see how well it worked there. Doing so wouldn't get me the classic antenna-on-the-roof look I wanted, but it would keep the antenna and rotator unit safe from the weather and it would probably last the rest of my lifetime. 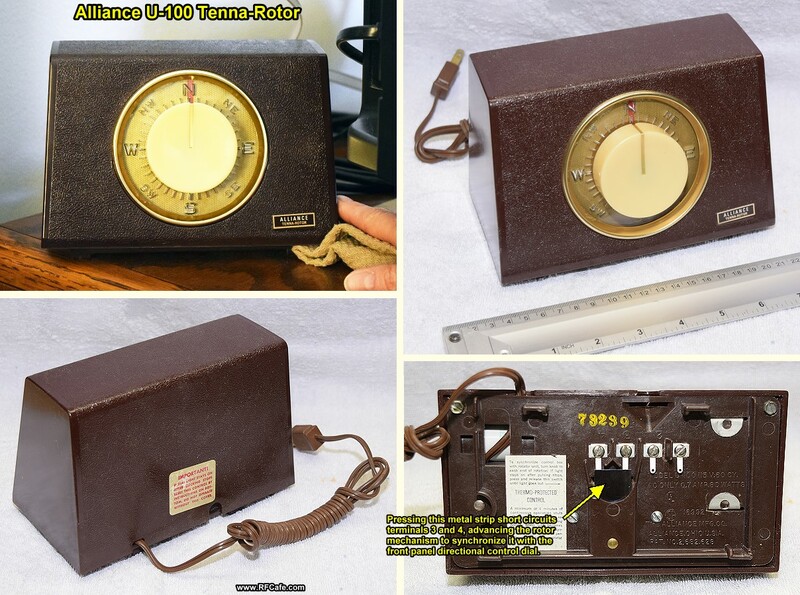 The antenna is a top-of-the-line Channel Master CM−5020 model that covers the VHF and UHF television bands, and also the FM radio band. My primary interest is being able to pick up radio stations since I rarely watch TV. A half-wave folded dipole has been used for many years, but because of where my house is located reception quality varies throughout the year and according to the weather. Often time I would need to re-orient one or both sides of the dipole to get good pickup. Sometime I couldn't get even relatively nearby stations no matter the orientation. 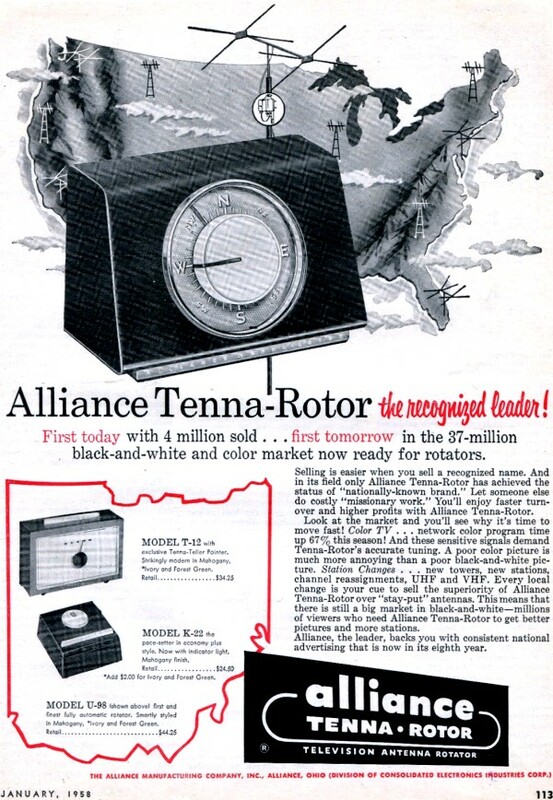 Now with the mighty antenna and Tenna−Rotor I can dial in any station I want and get super strong, static-free reception.